Mina Hotel Restaurant has a magnificent view of the Marmara Sea where you´ll have a great time while having your drink and dinner.Local and international selection of specialities,local drinks,import are served. Mina Hotel Roof ,You can enjoy all the beauties of İstanbul from the Terrace of Mina where you can see Princes Islands Bosphorus and Bosphorus Bridge Golden Horn and all historical Peninsula. Cafe Mina Hotel is at the lobby floor.You are welcome anytime during the day to taste different kind of coffees and desserts.Hot and cold are served in a nice and relaxing atmosphere. Sauna & Massage a rehabilitation center for the relaxation of all your muscles, the elimination of toxins out of your organism and fastening your blood circulation at the end of a tiresome day or after your sport activities. The massage implemented with knowledge, systematically and with a specific mechanical energy by the expert massagers of All Seasons Hotel will provide the rehabilitation of your tired and sick organs, and also the relief of myalgia and arthralgia. Mina Hotel Other facilities are fitness center, Massage room, TV- meeting room. Mina Hotel rooms have offers you all the authenticity and glamour of Antique Istanbul, with its functionally decorated 46 rooms. All rooms are equipped with electronic room key locks, central air conditioning,minibar,cable tv,safe in the rooms,direct dial telephone,wireless internet access (free),bathtub, hair-dryer plus 24 hours room service. 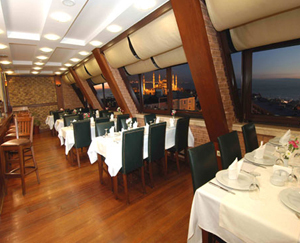 Terrace of Hotel Mina has a magnificent view of the Marmara Sea. You'll have a great time while having your drink and dinner. Local and international selection of specialities, local drinks, import drinks are served. The world famous turkish cuisine is our profession...the best recipes of different geographical zones...a romantic atmosphere with a wonderful panorama view of the old city and marmara sea.